Finished Size: Fits standard 11.5″ (29 cm) Barbie doll (with the belly button). 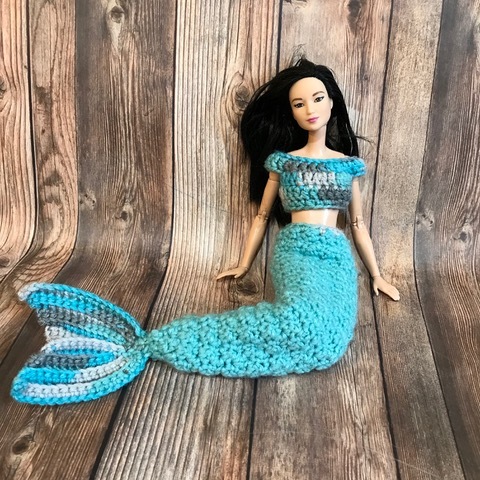 Please note that there are various Barbie body types on the market today such as “Curvy,” “Tall,” and “Petite.” This pattern is designed for the classic body type because it’s the most widely available. Tail measures approximately 10.5″ (27 cm) to end of fins. Gauge Swatch: 2″w x 2″h (5 cm x 5 cm) ch 11. Invisible join to first sc. Use starting tail and a yarn needle to sew the small hole at the bottom of tail closed. Note: Stitch count will decrease by 2 each row with 8 sc at end of Row 7. Sl st to next st. Finish off, leaving a tail for sewing. To attach, place the fins so that the final Row 7s are touching. (The beginning ch is the outside of the fin.) Sew together two stitches on Row 7. Then attach the fins to the bottom of the tail. 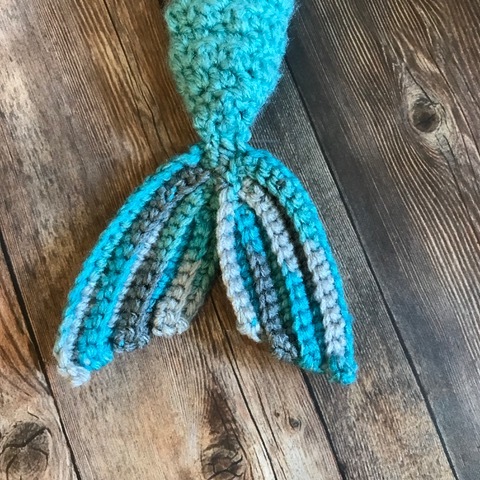 This entry was posted on Thursday, April 4th, 2019 at 12:00 AM by Claire Golden	and is filed under Free Crochet Patterns. You can follow any responses to this entry through the RSS 2.0 feed. You can skip to the end and leave a response. Pinging is currently not allowed.